In my curly hair history, I've either always had a curly bob and loved it, or I was in the unsatisfying process of trying to grow it out. Usually a month into my curly bob, I would start getting lost in my long hair fantasy and cancel my hair appointment. As my hair grew longer, my curly bob would start turning into a 1970's Peter Frampton look, and it was downhill from there. My hair is fine and very prone to frizz. It takes a lot of work to get my 2c curls defined and relatively frizz free. The longer my hair would grow, the harder it became for me to take care of. Most of the time I would end up wearing it pulled back. It may have been my need for a better haircut or my lack of patience, but I never made it into my long hair dream. I was then always disappointed in myself for not reaching my hair goal. I felt like longer hair was somehow more attractive, sexier and more beautiful than short hair. Recently, I realized this struggle was exactly like the straight hair vs. curly obsession that I lived through all my teenage years and well into my thirties. What am I doing? I can't imagine going back to straight hair! When I look at pictures of my hair when I was most vigilant about straightening, I'm always surprised that I liked it. My hair closely resembled straw on a good day. 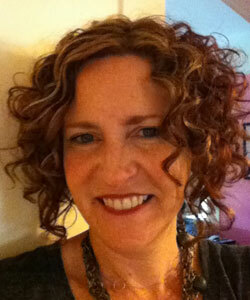 I now like my curly hair thanks to NaturallyCurly.com and my good friends with curly hair. I have learned how to embrace and take care of my curls. So why am I still struggling with the curly bob vs. long hair issue? A few weeks ago after my most recent curly bob haircut, I had a few moments of shock. But the moments were fleeting and I realized that this curly bob was the best one ever. It was a spontaneous decision to cut my hair, and I have left my long hair obsession behind. I already made a hair appointment for 8 weeks from now. I'm loving the compliments, but most of all I am thrilled that I like it. I still think long curly hair is gorgeous, but my curly bob is just as fabulous. I cowash every day. I never get second day hair, and have given up on trying. The time I spent on trying to get second day hair looking like first day hair is now better spent on cowashing and starting fresh. I recommend Elucence Moisture Balancing Conditioner, Curl Junkie Curl Assurance Smoothing Conditioner, As I Am Coconut Cowash Cleansing Conditioner, Sunny Island Lavender Jamaican Black Castor Oil Natural Deep Conditioner. Once a week I wash my hair. My favorites include: Curl Junkie Curl Assurance Gentle Cleansing Shampoo, Elucence Mosture Benefits Shampoo. Once a week I do a deep conditioning treatment. My favorites include: Mop Top Deep Conditioner, Curl Junkie Curl ReHab Moisturizing Hair Treatment, DevaCurl Heaven in Hair. Once a month I do a ACV rinse or use a clarifying shampoo. My favorites include: Apple Cider Vinegar as a cleanser, Alba Botanicals Clarifying Shampoo. I sleep on a satin pillowcase and never touch a terry cloth towel to my hair. I always use the Curls Like Us Cloths. Next, I use a mousse because I need the volume and definition. I apply the mousse in four sections. I use a tablespoon in each section, gently scrunching it into my curls. All of these mousses have a good hold to them, which I need: AG Foam Weightless Volumizer, Curlisto Bio Gel Mousse, DevaCurl Volumizing Frizz Free Volumizing Foam. Then I diffuse my curls with my head upside down until it is almost dry. I follow with gently scrunching and I am good to go. If my hair starts to get a little frizzy midday I always keep a pomade in my purse: MOP C Glisten High Shine Pomade. Have you learned to embrace your curls, whether they are short or long?